It's such an inspiring space. There are different angles and something different every place you look, so that's really exciting as a student, to work in something that's different. When I walk into the building, I just feel such a strange mix of emotions because it's such an unconventional space. I think we've all been seeing the outside as it's been unfolding and be excited about what it might mean, but when you walk in - but the lovely warmth of the use of timber is the first thing that strikes me. I'd like to think at UTS, we are approaching business as unusual, and for me, that's what this building says. This is the building as unusual - this is the place where you can sort of play with ideas. The concept of collaboration, of working together and understanding other people's ideas and issues, has a great capacity to emerge in this type of environment. For a start, the physical layout is going to change the way that we teach. This room breaks the way that we traditionally structure a room in terms of the teacher-student dynamic, so that's going to change the method and the technique with which we teach. You've got collaboration in these new formal teaching spaces, and that's terrific, but I think the really exciting thing from both a teaching and learning perspective is that when class finishes, you see students sitting around putting all those ideas into practice. The informal spaces in the building are essential to a postgraduate student. It's really essential that we have places that we can get together and collaborate, places that we can meet and work on things together. Education is no longer about something where you're locked away for a few years, you learn things, then you go out and see what the real world is doing. More and more, industry needs to come back in. It's a building that reaches out to the world. It goes beyond the walls. It really means that we can do here is become much more global. This new building will really have an impact on postgraduate education. What we do at UTS Business School has always been about collaboration with industry, it's about problem solving and it's about reframing problems so that we can come up with creative solutions. It's shaping what the university says about itself, but it's also a marker to that creative, digital hub in which the whole university is now sitting. Located in the City Campus’s Haymarket precinct, the building is a landmark along the 'cultural ribbon' that extends from the Sydney Opera House down to UTS, taking in Darling Harbour and The Goods Line development. Additional project team members included: AW Edwards (early works contractor); AECOM (services engineer); Arup (structural engineer, transportation and traffic); RPS (statutory planner); Casey & Lowe (archaeological consultant); Godden Mackay Logan (heritage assessment); Morris Goding Access Consulting (accessibility consultant); Wind Tech Consulting (wind assessment); AECOM (ecologically sustainable development); Australian Museum Consulting (Archaeological Investigation & Excavation); and Dominic Steele Consulting Archaeology (Aboriginal archaeological investigation). 2015 Good Design Awards: Product Design – Hardware and Building Award (opens external site) for its custom-made bricks. 2015 AIQS (Australian Institute of Quantity Surveyors) Infinite Value Awards: Innovation Project Award (opens external site). Finalist for the Green Building Award in the 2015 World Environment Day Awards. Top 10 category finalist in the biennial, international Wienerberger Brick Awards. 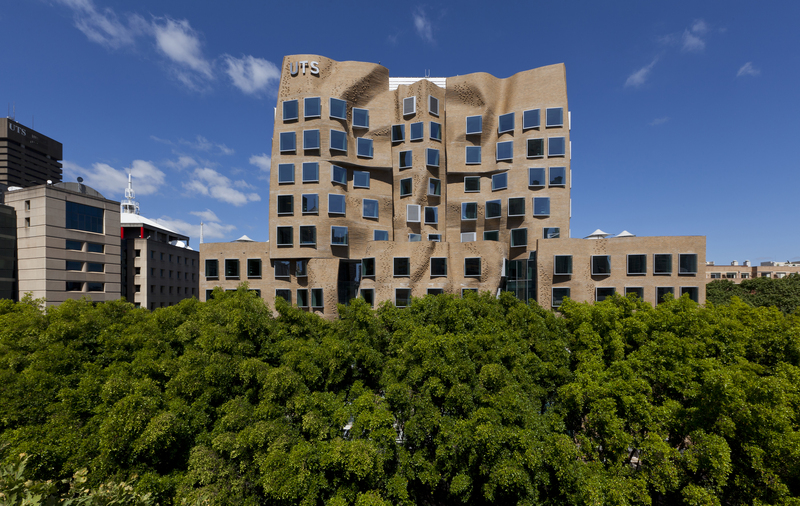 For more information about UTS sustainability awards, visit UTS Green. The public levels (2-5) of the building are open from 8am-10pm weekdays and 8am-6pm weekends, with access via Ultimo Road, Mary Ann Street and The Goods Line in Ultimo. Visitors are welcome, but please be mindful that classes may be in progress. For more information email masterplan.feedback@uts.edu.au. Can’t get to the building in person? Take a virtual tour to explore all the key features of the Dr Chau Chak Wing Building. © Copyright UTS - CRICOS Provider No: 00099F - 24 September 2018 01:18 PM. The page is authorised by Director, Marketing and Communication Unit.